Remember how we told you that the resolution of Google Maps' satellite images would soon be improving? Well, it's not the night and day double the resolution just yet, but today Google has begun rolling out much-improved 3D images to Google Earth. New York and San Francisco are the first to get the high-res treatment, but we should see this update rolling out for more cities around the world in 2015. The boost in quality is coming from the Worldview-3 satellite, which was launched in August of this year. It's 18 feet long and weighs 6,200 pounds (on Earth), and it's powerful enough to count chickens from space. It can also automate filtering to better correct for lighting and atmospheric effects. The result is a very clear image which Google has 3Dified. UPDATE: While these improvements are indeed the result of better high resolution cameras (and improved algorithms), Google reached out to let us know that it is not, in fact, the Worldvidew-3 satellite that is responsible. Google went on to say that "we have no plans to share at this time regarding integration of the Worldview-3." In a way, this is good news, because it means images will likely get even better than what you see below, but still, mea culpa. 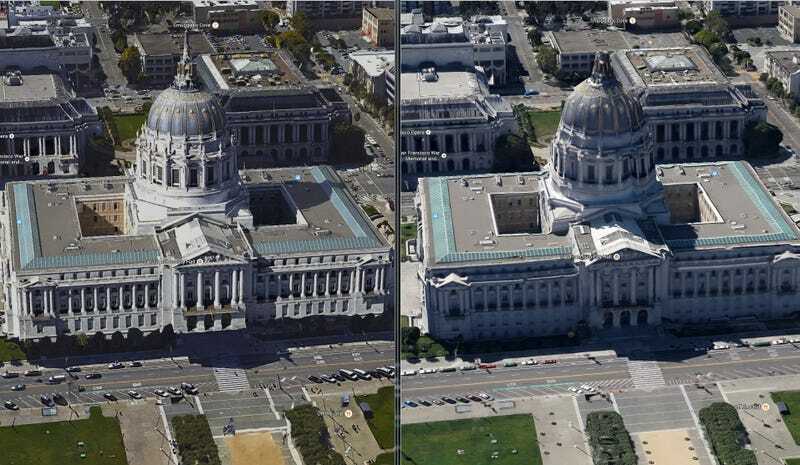 Above you see San Francisco's City Hall, with the improved image on the left and the old image on the right. Below are some more examples, which follow that same format (new on the left, old on the right).